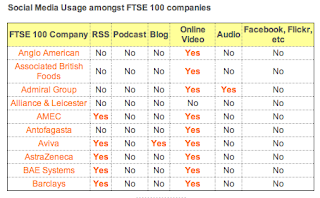 Real Fresh TV blog are doing a study of social media usage amongst FTSE 100 companies. They're just kicking if off, and have posted findings on the first ten. Of which, only one is blogging and none is involved with the likes of Facebook. Wonder what the stats would look like for the top Irish companies?